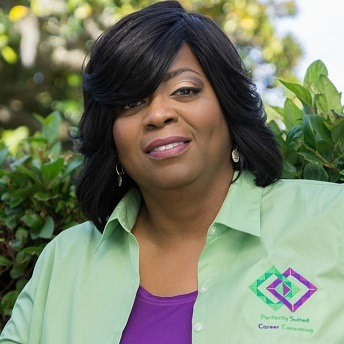 Alfreda Boney, founder of Perfectly Suited Career Consulting, launched the business after seeing first-hand the difficulty that both job seekers and employers encounter when trying to find the right job fit. "In 2003, I started as placement coordinator at a private staffing agency before joining the Georgia Department of Labor," she said. "That was where my passion came from seeing people not able to find the right work even though there were plenty of jobs. That is when I started my consulting business in 2008." Boney has grown the business into a career training and professional development consultancy that provides diverse services. "I work with youth and adults as it relates to all things career," she said. "I do accredited customer service training and career presentations including interview and resume preparation and consulting packages. A lot of our business is the facilitation of workshops and seminars. I also speak on career development. I assist small businesses with retention and attrition. It's more than just hiring people. It has to be the right fit between employer and the incoming employee. I'm able to answer those questions a job seeker normally doesn't have answers to during their search. I bring back that connection so the employer communicates who they are and that helps eliminate frustration down the road." Boney's advice for aspiring entrepreneurs is to cultivate relationships. "Be open to relationships because you can't do everything by yourself," she said. "You have to connect and network with other like-minded individuals because it will only enhance what you do. There's no competition because they can't do it like you do it."